The following text about Irish diplomatic missions abroad was submitted to the Irish Times for consideration yesterday – as I haven’t heard anything I’m assuming it wound up in the bin. Last week I spoke to an Irish government minister – a thoroughly decent man – who told me that “Ireland’s reputation abroad is improving“. It pained me to tell him that I had just come from abroad, and it isn’t. According to figures acquired under the Freedom of Information Act, the Irish government spent some €76 million on Ireland’s missions abroad. At home there has been the usual furore about over-paid civil servants wasting taxpayer’s money. From abroad, it looks slightly different. I have lived in Sweden for over 12 years and worked with all the Scandinavian embassies to promote Irish business, culture and sport. I have seen at first hand how Ireland’s embassies abroad work to improve our image and reputation, and bring valuable investment in trade in tourism to the country. I have witnessed their tireless dedication as they struggle with the protocols of their office whilst trying to portray Ireland in the best possible light. I have spoken to them on the phone in the middle of the night when an Irish person was ill or passed away abroad and needed to be brought home. I have seen what they do for the Irish community abroad – much of it tedious, very little of it glamorous. They co-ordinate everything from trade fairs to St Patrick’s Day parades to poetry readings, as well as having the envious task of trying to ensure that state bodies like Enterprise Ireland and Bord Bia all sing from the same hymn sheet. In truth, far from being too much, the resources they receive are often far too little for the job of work that needs to be done. In times of austerity there is always a tendency to insist that we all wear the hairshirt, and woe betide anyone not seen to be suffering. In doing so, we ignore the fact that many diplomats spend their careers abroad, sacrificing friends and family ties in the process. Is there waste in our foreign missions? Undoubtedly. Do certain missions cost too much for what they bring in? Again, the answer is yes. But for the most part we need them, if only to go around cleaning up the mess made in the international arena by our politicians. The foreign service is not being singled out for criticism when it comes to spending either; every government department is now fair game. In our unrelenting search for cuts to make so we can pay back unsecured bondholders, we are scrabbling down the back of everyone’s sofa for pennies – except, of course, those of our bondholders. In doing so, we are risking a kind of sovereign anorexia; in our desperate attempts to look pretty for the troika and the markets, we are denying ourselves the basics of a functioning state – a welfare system, education, a health service, a well-resourced diplomatic corps. And when the situation changes and there is an opportunity for economic growth, there is a danger that we will be so weakened that we are unable to fight back. The thousands who have recently left the country will tell you the same story; even for our own people, Brand Ireland is damaged. 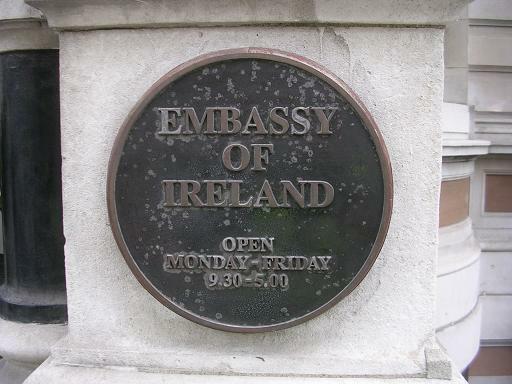 But it can be repaired, and the Irish foreign missions are at the forefront of that repair work. Already under-resourced and under pressure, this latest barrage of criticism does nothing to help them. Maybe the minister is right- maybe Ireland’s image abroad is improving. And if it is €76 million will be a cheap price to pay, given the scale of the self-inflicted damage we have done in recent times.